Heavenly Mountain Resort has started construction on a major expansion of its summer attractions that will include a new alpine coaster ride, an extensive zip line network, mountain bike park, multi-use trails and tree canopy tours. The project, which has been in the works for many years, has steadily been gaining the approval of various governmental agencies. Last month, the final OK came when the Lahontan Regional Water Quality Control Board voted “yes” on the venture, which is dubbed Epic Discovery. Construction on the alpine coaster, similar to those at Park City and Breckenridge, starts this month. It will operate year-round after opening late this year at the South Lake Tahoe resort. Guests ride individual sleds down an elevated track that winds down amid the pines and rock formations. Gravity takes care of the descent while riders maintain control of how fast they want to go. Also this month, the resort debuts a new four-line zip line called the Hot Shot Zip Line. 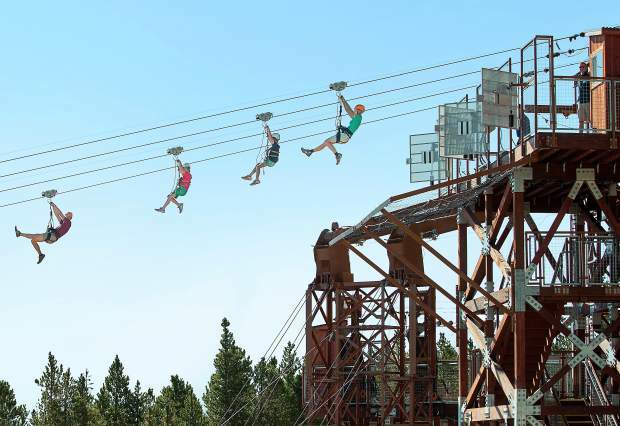 An existing zip line, dubbed Blue Streak, is slated to re-open late this month. Some of the zip lines at Heavenly will incorporate tree canopy tours. Bikers have long eyed the vast slopes of Heavenly, which stretch for miles across California and Nevada, as a place where they might some day peddle to their heart’s content. They likely will have to wait another couple years as the new mountain bike park will take time to develop before it opens. Work crews currently are busy toiling on a new permanent 35-foot-tall rock climbing wall, which is slated to open in August. It will feature 18 climbing routes with automatic belay systems and a quick-jump 35-foot rapid descent that emulates free-falling. Another lane has been added to the tubing hill and will be open late this month. In September, Heavenly will offer mountain excursion tours via 4×4 vehicles. These guided tours will feature narrations on the mountain with information about the history, culture and environment of the region. And children will have a crack at the zip line experience when a smaller kid-specific 150-foot long zip line opens later this summer. Bob Goligoski, a former newspaper reporter, has been writing about the ski industry for various newspapers and magazines for 45 years. He has skied at more than 125 resorts around the world. This entry was posted in Bob Goligoski, Heavenly by Jerry Rice. Bookmark the permalink.